Habit 1 – Be Pro-active. Covey distinguishes between pro-active people – people who focus their efforts on things which they can do something about – and reactive people, who blame, accuse, behave like victims, pick on other people’s weaknesses, and complain about external factors over which they have no control (for example, the weather). Pro-active people are responsible for their own lives. Covey breaks down the work responsibility into two parts: response (especially choosing a response) and ability. Pro-active people recognise their responsibility to make things happen. Those who allow their feelings to control their actions have abdicated responsibility and empowered their feelings. When pro-active people make a mistake, they not only recognise it as such and acknowledge it, they also correct it if possible and, most importantly, learn from it. Habit 2 – Begin with the end in mind. Leadership is about effectiveness – the vision of what is to be accomplished. It calls for direction (in every sense of the word), purpose, meaning, and sensitivity. Management, on the other hand, is about efficiency – how best to accomplish the vision. It depends on control, guidance, and rules. To identify the end, and to formulate one’s route or strategy to achieving that end, Covey maintains the need for a ‘principle-centred’ basis to all aspects of life. Most people adopt something as the basis (or pivotal point) of their life – spouse, family, money, church, pleasure, friends (and, in a perverse way, enemies), sport, etc. Of course all of these have some influence over the life of every individual. However, only by clearly establishing one’s own principles, in the form of a personal mission, does one have a solid foundation. 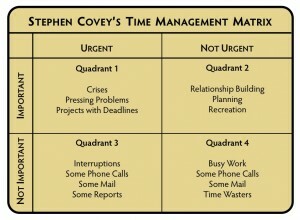 Covey’s first major work, First Things First, sets out his views on time management. It argues that the important thing is not managing time, but managing oneself, focusing on results rather than on methods when prioritising within each compartment of work & life. Quadrant I – Urgent & important – for example, crises, deadlines, unexpected opportunities. Quadrant II – Not urgent, but important – for example, planning recreation, relationship-building, doing, learning. 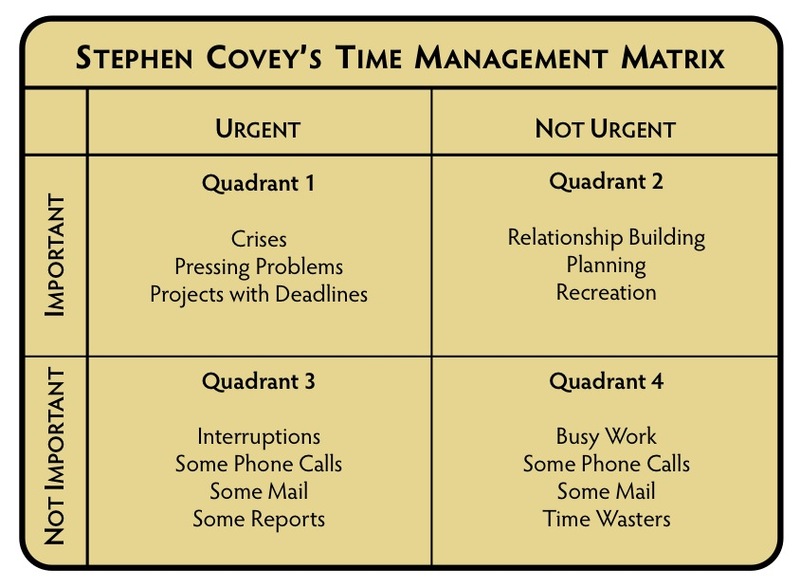 Quadrant III – Urgent but not important – for example, interruptions, meetings. Quadrant IV – Not urgent & not important – for example, trivia, time wasters, gossip, excessive TV watching. Quadrant I – stress, burn-out inability to manage time (& thus loss of control of one’s own life). Quadrant III – short termism, loss of control, shallowness, feelings of being a victim of circumstances. Quadrant IV – irresponsibility, dependency, unsuitability for employment. 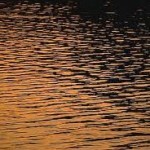 Habit 3 is therefore about managing oneself effectively, by prioritising according to the principles adopted in Habit 2. This approach transcends the office diary or day-planner, embracing all roles in life – as manager, mentor, administrator, strategist, and also as parent, spouse, member of social groups, and as an individual with needs and aspirations. Habits 1-3 are grouped under the banner of ‘Private Victory’, as they are the basic paradigms of interdependence. Interdependence occurs when there is co-operation, not competition, in the workplace (or the home). Covey holds that competition belongs in the marketplace. Covey points out that, from childhood, many people are conditioned to a win/lose mentality by school examinations, by parental approval being rationed to ‘success’, by external comparisons and league tables. This results in a ‘Scarcity Mentality’, a belief that there is only a finite cake to be shared: a ‘Scarcity Mentality’ is evident in people who have difficulty in sharing recognition or credit, power or profit. It restricts their ability to celebrate other people’s success, and even brings about a perverse satisfaction at others’ misfortune. Celebrates success, recognising that one person’s success is not achieved at the expense, or to the exclusion, of others. Understands and seeks a win/win solution. Habit 5 – Seek first to understand, then to be understood. ‘I just can’t understand my son…he won’t listen to me/’. The absurdity of this statement is highlighted by Covey in emphasising the importance of listening in order to understand. Clearly, the parent needs to stop & listen to the son if he or she truly wants to understand him. 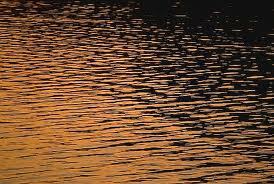 Likewise, when you feel that someone is genuinely seeking to understand your point of view, you recognise & share their openness & willingness to negotiate & to reach a win/win situation. The essence of synergy is where two parties, each with a different agenda, value each other’s differences. Everything in nature is synergistic, with every creature and plant being interdependent with others. We also have personal effectiveness where there is synergy at an individual level – where both sides of the brain are working in tandem on a problem or situation: the intuitive, creative, visual right side & the analytical, logical, verbal left side combining to achieve the optimum outcome.Synergy is lacking in insecure people: they either clone others, or else try to stereotype them. Of such insecurity is born prejudice – racism, bigotry, nationalism, & any other form of prejudging others. The seventh & final habit relates to renewal. 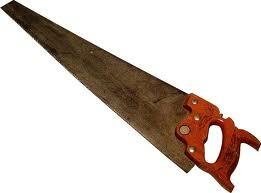 Just as a motor car or any other sophisticated tool needs regular care & maintenance, so too do the human body & mind. The social/emotional self – which connects with others through service, empathy, & synergy, & which is the source of intrinsic security. The spiritual self – which through meditation, reflection, prayer, and study helps to clarify & refine our own values & strengths, & our commitment to them. The mental self-building on to our formal education through reading, visualising, planning, writing, & maintaining a coherent programme of continuing personal development.